Then I realised the site I was shopping are selling winter clothes...not suitable at all better go somewhere else...Times Square, Sungei Wang or Kenanga Wholesale City. Acceptable quality and price. Sister bought Shiseido Senka Hyaluronic Acid whitening fresh toner after trying Hada Labo... I find that Hada Labo is thicker than Shiseido, but Shiseido has 30ml more than Hada Labo. This is cheaper about RM30+, Hada labo is about RM40+ per bottle. She also bought a whitening lotion by a famous brand from Taiwan, Naruko to replace Hada Labo whitening lotion. The red bottle is NARUKO紅薏仁超臨界美白乳液 (120ml) . 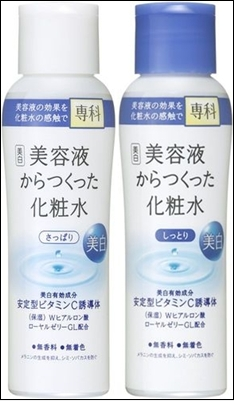 I find that Hada Labo Whitening Lotion is not suitable for my skin, makes my skin more oily after applying it. (Or maybe Malaysia is too humid and my skin is not extra dry that type.) I like naruko lotion more! They are having year end promotion now, buy 1 free 1 for the red bottle lotion and discounts on others. Have a look now! Going to buy another 2 more for the red bottle one for myself and my mom. www.naruko.com.my This is the official page in Malaysia, goods shipped from Johor. Reliable no worries. ;) Sometimes they will have discounts for selected goods, so it would be cheaper than retail shop. My sis bought the red bottle one for RM39 (included Poslaju) instead of about RM42 selling at Watsons. In addition they are doing promotion for this lotion starting from Christmas to 27th December 2013. Bought a powder type mask to enjoy too. And 1 new thing to try, that is the Acenoble brand collagen serum. Hehe I'll use everyday at the same time let my mom to use it, hopefully she will have younger and better look skin after using it! SPEND SPEND SPEND BUY BUY BUY!! !